Logo, Business Card, Email Signature, Brochure and Website Design. Hirecorp is an Australian and family owned business that hires and sells equipment created to suit the professional tradie, builder or contractor, our range of hire equipment is amongst the best available. Hirecorp products are sourced globally – some exclusive to Hirecorp, some specially adapted for the rigours of hire and all up to date and “Hire Tough” to meet the stringent Hirecorp standards. Mediamojo started off with the Hirecorp logo. 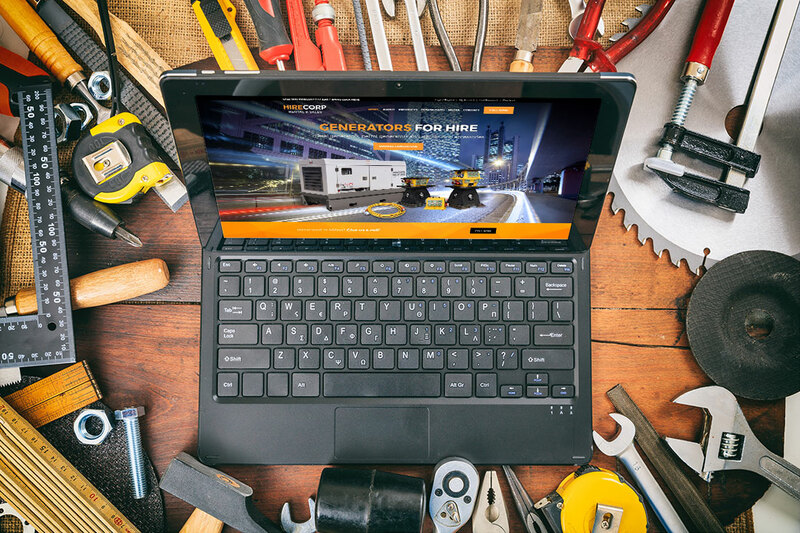 Hirecorp needed something with a look and feel of a construction company to attract users within the industry as their new website would display construction equipment for rent and for sale. After the logo was approved, Mediamojo also created other branding such as business cards and email signatures. The website’s purpose was to create an attractive and engaging interface where users can easily learn about the available products for hire and sale and submit their hire/sale request. We applied cutting edge design and function to ensure the new website will be easily viewed on all devices; mobile and desktop. The look and feel of your site will be focused on a construction / industrial theme to create a familiar and relaxing environment for your target demographic. Customers will be guided through their search to and inquiry form as well as to clearly promote the Hirecorp contact phone number for quick and friendly response via the phone. This will be set up as a click to call so all mobile users can easily make contact on the go. Products Pages will contain detailed information and specifications as well as a visual gallery of related images. Easy to use Inquiry Forms will be added to help capture client info and queries as well as click to call buttons.